When a child has difficulty with reading, concentrating, confusing their left and right sides, or reversing letters, their challenges may indicate an undiagnosed vision problem. He or she could be struggling with eye movement skills or visual processing skills due to an underdeveloped ability to move or coordinate their eye muscles or an inability to process visual information through the brain efficiently. A functional vision exam by an optometrist who specializes in developmental vision care can either rule out or diagnose a learning-related vision problem. If a child is found to have a vision problem that cannot be corrected with eyeglasses, a comprehensive, individualized vision therapy program often leads to significant improvement in a relatively short amount of time. Eye movement skills or visual processing skills can be trained and developed through practicing a prescribed set of activities that a child will undergo with the guidance of a trained vision therapist. At the Visual Learning Center in Olney, MD, we suggest students supplement their in-office therapy with practice at home. The vision therapy stickman activity is simple but effective. The person doing the activity is instructed to view a sheet that contains simple drawings of a figure wearing one glove or shoe, then say which hand is wearing the glove or which foot has a shoe on it. The goal is to first reach accuracy, then enhance difficulty by increasing speed or including rhythm elements. Download your activity packet here. Can vision problems affect my child’s life outside of school? While many vision problems are first suspected in a school setting or learning environment when a child has difficulty with reading, writing, math, or engages in disruptive classroom behavior, vision problems can also significantly affect the child’s life outside of school. If a child has a visual processing issue, seemingly simple tasks may be more difficult for him than other children. He may struggle to learn how to tie his shoes, match his socks, or follow demonstrated instructions. You might notice that he has trouble remembering his own address, phone number, or retelling stories about something he watched on television or experienced. Vision problems also affect social interaction. Your child might appear awkward, clumsy, or other children may complain that he is invading their personal space, because he has trouble with spatial and body awareness and depth perception. The other children might treat him differently because he has developed coping habits, such as constantly rubbing his eyes, squinting, or tilting his head, or because he often complains of headaches or nausea. He may become distracted while talking or ignore the rhythm of a conversation and other social cues. Children or other parents might unfairly judge this behavior as unmannerly or inconsiderate. In addition to learning difficulties, vision problems can affect physical activity as well. A child with an untreated vision problem may perform poorly in sports due to clumsiness, poor hand-eye coordination, inability to focus, or skewed depth perception. They may be picked last for teams; or the the other children may leave them out of games or tease them. Dealing with difficulty in school, awkwardness in social settings, poor performance in physical activities, and strained relationships with parents is a lot for a child to handle. While children with other learning disabilities may excel in sports or sociability, vision problems interfere more often beyond the classroom. Falling behind academically and being treated differently by peers and adults can lead to low self-esteem and withdrawal. Fortunately, a personalized vision therapy program treats visual processing problems. Vision therapy, also known as vision training, is likely to significantly improve performance in academic, athletic, and social settings. In fact, one of the first benefits of vision therapy parents often report is that their child’s self-esteem improves dramatically shortly after starting a vision therapy program. Dr. Philip Nicholson’s Visual Learning Center treats visual processing problems with individualized vision therapy programs in our Olney, MD office, convenient to Silver Spring. Contact us today to schedule a comprehensive exam and consultation. It’s Teacher Appreciation Week, and we want to express a big thank you to all of the teachers who support students in the classroom. At the Visual Learning Center, we work daily with children who have struggled in school due to learning-related vision problems, sometimes for years before receiving a diagnosis; and their caring, patient, and skilled teachers deserve appreciation for their dedication to each child’s success. Classroom teachers serve as our allies and partners in vision therapy, so we wish to celebrate their service to the community and welcome the opportunity offer our support in return. When a child has difficulty in school — particularly if parents feel confident that their child is smart — teachers sometimes endure undue blame. Parents are understandably frustrated when a child performs poorly and may assume the teacher should know what to do to improve their child’s performance. Teachers are educated in a wide variety of subject matter, teaching methods, and classroom management skills; and they receive training in detecting possible learning disabilities and special needs. However, the majority of teachers are unaware of how common learning-related vision problems are, and most teachers simply do not know how to recognize the symptoms. Once teachers learn about how vision affects learning, they begin to recognize vision problems in their classroom right away and realize this is something they have been dealing with for years. So, how can teachers get the help they need? As you may recognize, many of these symptoms can also indicate learning disabilities, dyslexia, ADD/ADHD, or even health problems; and consequently, misdiagnosis is common. A possible vision problem is often overlooked. If you are a teacher, you can expect that parents may dismiss your suggestion that their child has a vision problem because he or she has “20/20 eyesight.” It is important for teachers to understand that the vision problems that affect learning are not usually detected during routine vision screenings at school or typical vision exams with the family’s eye doctor. Typical vision exams only test for eye sight, or vision clarity at a distance. However, vision involves an entire vision processing system — the coordination of eye muscles and the brain. A healthy vision system can function well over prolonged periods of time in a classroom setting; but if the child has a vision problem, he will grow tired and frustrated, not understanding why he has so much trouble doing tasks that seem easy for his peers. So a child with vision problems might seem to give up, have low self-esteem, or act out as a result. Once a child is properly diagnosed by an optometrist who specializes in functional and developmental vision care, he can take part in an intensive individualized vision therapy program, which is likely to bring about remarkably fast and long-term results. To learn more about vision and vision therapy, download our free guide, watch our webinar, and see our resources for teachers and parents. If you are a teacher in Olney, Silver Spring, or the surrounding area, invite Dr. Philip Nicholson to speak at your school or association. Click here to learn more. Is vision therapy a “proven therapy” or is it “quackery”? Vision therapy is a proven therapy that is well-documented in medical journals, scientific literature, and supported by the National Institutes of Health (NIH) in Bethesda, MD, not far from our center. Despite vision therapy’s solid reputation in the scientific community, awareness about learning-related vision problems and vision therapy’s effectiveness is not widespread. Lack of familiarity sometimes creates a healthy dose of skepticism, which we discuss regularly with parents. When you learn about something new that challenges previously held beliefs, it is natural to view it with a critical eye. If a child has considerable difficulty reading or writing, your first thoughts are likely to suspect a learning disability or dyslexia. If a child has attention or behavioral problems, popular opinions point to attention deficit disorders (ADD/ADHD). Learning-related vision problems may be new on your radar; and as a parent, caregiver, teacher, or pediatric occupational therapist, it is your duty to scrutinize new information and work in a child’s best interest. Obviously no doctor or practice ever wants to be accused of quackery or placed in the same category as a snake oil salesmen. Vision therapy is sometimes confused with “the Bates Method” or the “See Clearly Method” which do not have the same scientific basis or reputation as vision therapy, which is known in the medical literature as Orthoptic Therapy. Rest assured, vision therapy has been proven effective in treating visual processing problems. The NIH published results of a study, which proved vision therapy’s efficacy for the most common problems we find in students struggling in school. The Journal of the American Optometric Association has published articles about vision therapy’s effectiveness citing more than 260 peer-reviewed journals. The reason you are not more familiar with vision therapy is simply that you have not read the studies and journals, and the information has not been picked up by the media or distributed through other outlets. As practitioners of vision therapy, it is our job to inform you about it, and you will find many helpful resources on our website about it. At the Visual Learning Center, our vision therapy program is based on the latest scientific studies, and we have a proven track record of vision therapy success. Learn more about visual processing skill deficiencies and vision therapy by downloading this guide and watching this webinar. We offer vision therapy to children and adolescents with learning-related vision problems in our Olney, MD, office, which is convenient to families in Silver Spring. When parents notice a child reversing letters, they often assume that what they are observing is a sign or symptom of dyslexia. Dyslexia is a language-based learning disability that causes difficulty in writing, reading, and spelling. Children with dyslexia often reverse letters; however, while letter reversal in writing can be a symptom of dyslexia, this does not mean that every child who reverses letters has dyslexia. A child may reverse letters in the early stages of learning. As a child begins to practice writing, they will make mistakes or their motor skills might not be well developed yet. Parents and teachers should continue to observe and see if the child makes improvement with guidance and practice. Children who do not improve letter reversals within the first two years of schooling should be watched more closely and evaluated by a professional. The child could be dyslexic or have another learning disability. But there is also a another lesser-known cause that could explain the child’s tendency to reverse letters, such as ‘p’ and ‘q’ or ‘b’ and ‘d’ when writing. Learning-related vision problems interfere with the visual processing system and cause affected children to reverse letters. Without detection, diagnosis, and vision therapy, the child will continue to reverse letters and struggle with reading, writing, and spelling. Poor visual association: the ability to link what you see with something you saw, heard, or felt in the past. If a child is lacking ability or skills in the areas of visual association, integration, visual-motor, and recall skills, he will be more likely than his peers to continue reversing letters when writing. Intensive vision therapy will strengthen visual skills, and with training and practice, letter reversals can be eliminated. Without knowing and addressing the cause of letter reversals beyond the initial stages of learning development, a child will not automatically improve. Assuming the child is dyslexic may not help, unfortunately, because the methods used for helping a dyslexic child learn are different from the methods used to improve visual processing in a child who has learning-related vision problems. If your child is reversing letters beyond second grade or 8 years of age, we recommend screening for dyslexia and vision problems. Learn more about learning-related vision problems by downloading our free guide here and watching our webinar here. If you live near Olney, MD, schedule an appointment with the Visual Learning Center for a thorough vision assessment. Do the improvements achieved in vision therapy last? When a patient undergoes vision therapy, families often recognize remarkable improvement in a rather short period of time. Within a matter of a few weeks or months, many children are able to make significant progress. Noticeable improvement early in the vision therapy program instills confidence in patients and provides hope for families that their child will overcome the learning-related vision problems that have caused so much frustration and struggle. Because the child’s vision skills develop through vision therapy exercises, activities, and practice, parents often wonder if the effects will last beyond time spent in the program. Because your child has not undergone surgery and was not prescribed new corrective lenses or medication, you may suspect that vision therapy is not a permanent solution. Often parents wonder if the effects are a quick fix that will fade away with time. You may question whether your child will require vision therapy throughout his lifetime, become dependent on a lifelong costly treatment, or risk reverting to the problems experienced prior to participating in the vision therapy program. Not only do we expect the results your child experiences from vision therapy to last, we also expect improvements to continue. Your child will continue to use the new skills learned on a daily basis. Just like fitness and exercise, as long as she continues to use skills regularly, those skills will continue to function and even develop further. When your child learns new visual processing skills, these new skills will be used repeatedly, become habitual, and the visual system will begin to work correctly and more efficiently. In vision therapy, also known as vision training, your child will learn meaningful skills that are used in daily activities, so there is a high level of retention. You should notice continued improvement in your child as he or she progresses throughout the school year. Many of the skills we work on in-office during vision therapy will continue to strengthen as they are put to the test in a school environment. At the Visual Learning Center in Olney. MD, we stress the importance of having progress checks at 6 or 12 months after a child has completed a therapy program. This will ensure that the gains we made while in therapy are still holding strong, and we will make recommendations for continued improvement. Schedule an assessment appointment today. How are “Visual Skills” related to learning? 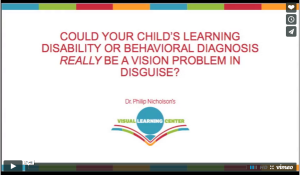 Discovering that your child is struggling to learn, not because of a learning disability or lack of classroom skills, but instead a problem with their “visual skills” can be confusing for parents. You might wonder how a child with 20/20 eyesight can also have a vision problem that is so significant that her learning is delayed or disrupted. Most people think that vision is the same as sight. So if that’s what you thought too, you’re not alone. However, sight simply provides the input for a child’s learning, while vision represents a complex system. When a child’s vision system is working efficiently, that child can process, understand, and relate new information to knowledge he or she already has. On the other hand, when a child’s visual system is not working as it should, visual skills deficiencies can contribute to learning problems. If children experience a lag in their ability to recognize what they see, and relate it to what they already know, and then use this information as a basis for future understanding, the learning process can become frustrating. For the learning process to work as it should, your child must first be able to see, then use what he sees to understand. The ability to see letters on a chart for an eye exam is not enough — 20/20 vision is not enough. Sound complicated? It is. But the good news is, many children with low visual skills are often quite bright, or they may have little enduring learning problems with proper vision therapy. Also known as vision training, vision therapy can improve visual skills significantly and quickly. A child’s ability to perform visual tasks (such as reading and studying) depends on the ability to synchronize thinking and seeing. The processes of thinking and seeing work together to give a perceptual and conceptual understanding of the material. The full spectrum of seeing and thinking needs to run smoothly for a child to gain meaning from what is taught. Vision therapy exercises improve the integration of seeing and thinking. Visual skills such as focusing, following moving objects, aiming, turning the eyes together as a team, visual processing and other abilities can be inefficient or poorly integrated, which can put great strain on a child. Vision training allows a child to practice and strengthen vision skills, lessening the strain and effort they will have to put forth. When a child’s attention and efforts are spread between trying to make the visual system work physically and understanding the material, attempting to learn anything new that requires visual skills can be discouraging. A child who does not have deficiencies in visual processing can simply focus on understanding the material, without the interference of trying to get their system to function as it should. Vision therapy serves to help children strengthen the link between vision and intelligence. Once visual skills are improved through vision therapy, it frees up energy and focus for actual learning. The less stressed mind is freed to focus on the task at hand. Vision therapy in Olney, MD, and convenient to Silver Spring, MD, is provided by Dr. Philip Nicholson, O.D. and his staff at the Visual Learning Center. Call 301-570-4611 for a comprehensive assessment and to see if your child might significantly benefit from vision training. How will vision therapy help my child in reading? Although it may not seem apparent at first, reading can be extremely difficult for a child with visual problems. When learning-related vision problems go undetected, a child might seem to be picking up on words and demonstrating comprehension initially, but overall performance and literacy will suffer. Studies have revealed that the greater the amount of effort a child must put forth to read, the lower the child’s overall reading performance and comprehension will be. Reading requires prolonged fixation on reading materials, so the effort necessary to read is particularly challenging if the child has visual deficiencies, such as oculomotor and binocular weakness. For a person to read, it is necessary for the two eyes to be properly aimed at text, so the eyes must turn inward. For some children, the eyes will naturally turn outward; and this deviation — even if slight and unnoticeable to parents or teachers — means that the child must use excess effort and energy to maintain fixation on the reading material. If a child is unable to aim his or her eyes inwardly easily, he or she may not see every word in sequential order. Instead, the child’s eyes may skip words or phrases, bounce around the text, and land at words sporadically. A parent or teacher might notice that a student omits or adds words to make sense of a sentence, without actually seeing those words. A child may be seeing double due to overlapping vision and experiencing headaches and eye fatigue as a result. But the child is often unable to express “seeing double” because he or she is unaware that the way they are seeing is not the correct way to see. Vision therapy or vision training treats and quickly improves eye disorders by facilitating exercises and activities that strengthen existing weaknesses within the visual processing system. Many children who participate in our vision therapy programs in Olney, Md. come to us having tested far below their current age levels in sensory skills, such as those related to oculomotor or binocular weakness. Upon completing therapy, they retake the initial screening tests with impressive results. Read some of our vision training success stories to learn more about how vision therapy can help your child in reading. Contact us to learn more about how vision training can improve speed and accuracy of eye movements, visual concentration, letter reversals and other skills, making learning easier, faster, and more enjoyable.